1. In a shallow plate, combine parmesan cheese, grated garlic, paprika, and Italian seasoning. Season the chicken with salt and pepper; dredge in the parmesan mixture; shake off excess and set aside. 2. In a large skillet melt 2 tablespoons of butter over medium-high heat. Cook chicken until golden on each side and cooked through – about 3-4 minutes for each side, depending on the thickness of your chicken. Transfer to a plate. 1. In the same pan, melt 2 tablespoons of butter. Fry the garlic and onion for 1 minute until fragrant — be careful not to burn. 2. Add the riced cauliflower to the skillet and stir to mix everything together well and coat in melted butter. Cook, stirring regularly for 1 minute. 3. Stir in the 2 tablespoons vegetable stock, about half the parsley, and lemon zest (if using). Cook for one minute to reduce juices then add the lemon juice and a few sprinkles of leftover parmesan cheese, if you like. 4. Adjust seasoning as needed. Stir in the remaining parsley. 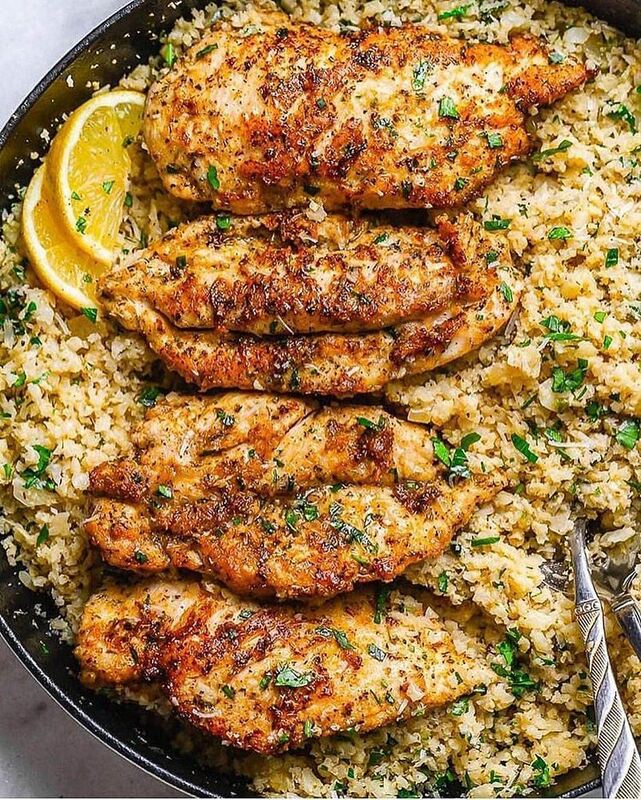 Return chicken over cauliflower rice and reheat quickly. Serve with fresh cracked black pepper, red chili pepper flakes, and more parmesan. Enjoy!